IBM® XL C/C++ for Linux is an industry standards-based programming tool used to develop large and complex applications in the C and C++ programming languages. It generates code that leverages the capabilities of the latest POWER9 architecture and maximizes your hardware utilization. 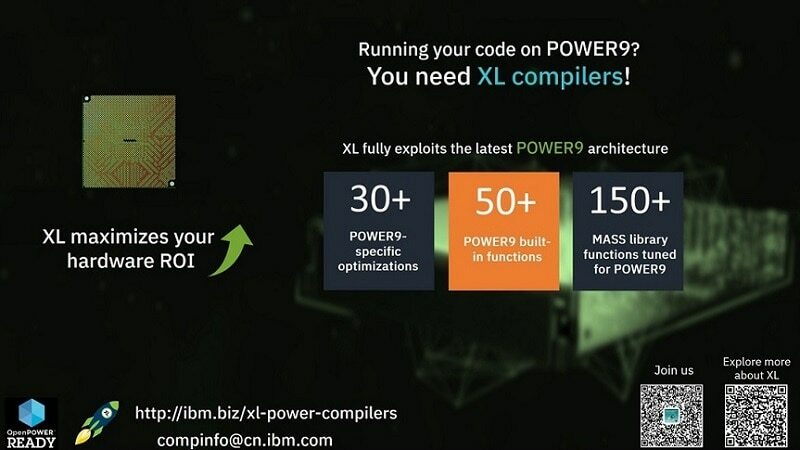 IBM XL C/C++ for Linux can also accelerate your applications by offloading computation and data to the NVIDIA GPUs. Allows for unlimited production use and provides a forum where your questions can be answered by IBM experts. Consider purchasing the License Charge Edition to obtain world-class IBM support. Provides high performance computing with support for Power Systems™ servers such as the POWER9 servers, and fully supports the OpenMP 4.5 programming model to accelerate your applications. Capitalizes on the POWER9 architecture; offer automatic parallelization of sequential programs to exploit modern multi-core processors. Adopts the Clang front-end technology V4.0 to provide GCC compatibility and adhere to the latest C/C++ language standards; fully supports the OpenMP 4.5 industry specification. Increases usability by providing diagnostic reports and debug capability at optimization.